Stock photo aerial view of some large industrial sites located on the shore of Lake Superior in the City of Thunder Bay, Ontario, Canada. 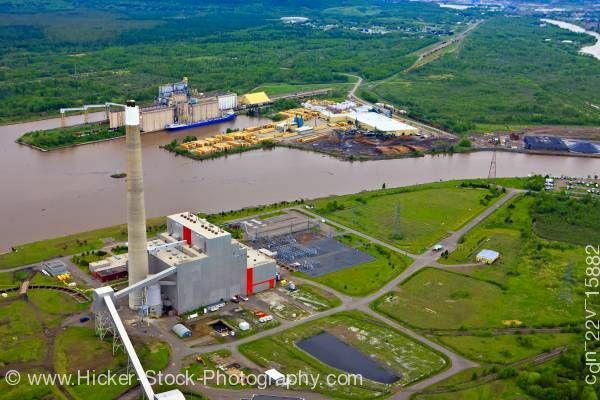 This stock photo gives you an aerial view of some of the large industrial sites situated on the shores of Lake Superior in the city of Thunder Bay, Ontario, Canada. Thunder Bay has been home to both iron and lumber industries in the past. The North Shore of Lake Superior runs from Duluth, Minnesota, United States, at the southwestern end of the lake to Thunder Bay, Ontario, Canada, in the north to Sault Ste. Marie, Ontario, in the east. The shore is characterized by alternating rocky cliffs and cobblestone beaches, with rolling hills and ridges covered in boreal forest inland from the lake, through which scenic rivers and waterfalls descend as they flow to Lake Superior.